It is proved beyond doubt: Winter has finally come! In December 2017, Ben and Patrick of Snow-Online.com have spent two weeks in beautiful Canada, exploring a whopping six ski resorts in both Alberta and British Columbia. Their first and last impressions were recorded in videos, which can also be found on Facebook under the hashtag #exploringthewest. You cannot believe you missed those? Well, why not becoming a follower of our Facebook fan page then? Ready, set, go! The first destination of our two-week round trip started at Mount Norquay. Being one of Alberta's most charming ski resorts, Mount Norquay is located about 6 km from Banff. Especially experts and advanced skiers find suitable slopes here; however, the ski resort also boasts terrain and super convenient slopes for beginners willing to improve their skiing skills. Let's see what the ski area has to offer! Sunshine Village definitely lives up to its name: Both perfect weather and – if that is even possible - even more perfect snow conditions is what awaited us on our second stop of our Canadian powder tour. Located at Banff National Park, just like Mount Norquay, it is one of the largest ski resorts in Canada with one of the longest ski seasons. Wide-open trails left us with the need to push ourselves here. 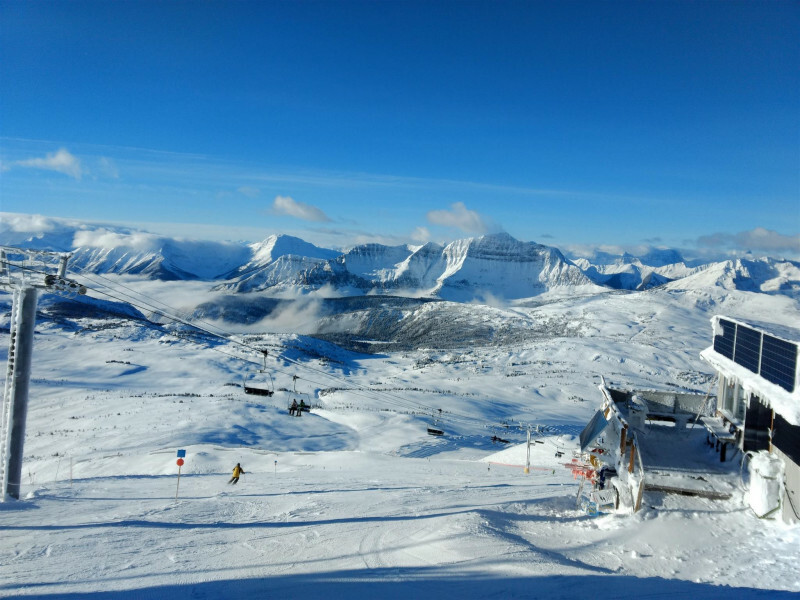 That being said, we just couldn't get enough of Sunshine Village's outstanding terrain and snow conditions, marvelous runs, and breathtaking panorama. Have a look or two at our video – you will be deeply impressed; promise! Lake Louise, third ski resort apart from Mount Norquay and Sunshine Village to form the Ski Big3, was next on our list: With 4.200 acres of skiable terrain, Lake Louise ranks among the largest ski resorts in North America, and it does not disappoint: All ability levels are covered on every. single. lift! Besides, the ski resort offers a unique panorama of the Canadian Rockies. What more could a skier wish for? Learn more about Lake Louise in our video. We say bye-bye to Alberta and “Hello, British Columbia“! First stop: Revelstoke Mountain Resort. The ski resort in the heart of British Columbia takes expert skiing seriously by featuring more than 45 percent of expert terrain, thus boasting extremely challenging runs. As a hotspot for freeride skiers and thrill-seekers. Get your fix of both snow and adrenaline while giving heli-skiing a try! Canada's second largest ski resort, Sun Peaks, features a skiable terrain of 4.270 acres on three mountains, namely Tod Mountain, Sundance Mountain and Mount Morrisey. A whopping 2.000 hours of sunshine and perfectly groomed runs make for unique skiing experiences and pure winter fun. Skiers can choose between 135 runs with 86 of them being open during our ski resort check in mid-December. Let's see how much of them Rachel, Patrick, and Ben were able to cover! Big White Ski Resort in British Columbia is one of the most snow-sure ski resorts in Canada - perfect conditions are pretty much assured. At altitudes of up to 2,319 metres, Big White further allows breathtaking views of the snowy surroundings. The ski area gave proof of both during our visit in December, as there was about a metre of snow on the mountain and the view was (unsurprisingly) unique - but why not see it for yourself in our video!